This year, on Sunday, August 2, 2015, The Flag Shop will have a booth set-up at the Vancouver Pride Parade Festival. Look for us there under the big blue tent where we will have all of our rainbow Pride products for sale. We will be donating proceeds from our Pride flag sales to the Vancouver Pride Society as well as collecting donations in exchange for our new (and exclusive!) Smiley Face Pride tattoos. However, first read here to learn a little more about why the Pride flag is so important to us, and what we’ve done through the years to demonstrate our passion for LGBTQ+ rights and freedoms. Video from GLBT Historical Society; Go to 7:00 for a glimpse of the Pride Rainbow Flag. Since then, The Flag Shop Pride products have been flown all over the country from military bases to provincial legislatures. In 2014, when anti-LGBT Russian policies created a wave of outrage around the Sochi Winter Olympics, many Pride flags were flown across Canada to show support for LGBT athletes and Russian citizens that were facing these inhumane policies. In Victoria, B.C. a last minute request was made to The Flag Shop Victoria for an almost four foot by seven and half foot Pride flag, essentially needed yesterday. Paul Servos, the owner of The Flag Shop Victoria, managed to sew it together and deliver it in about 3 hours, and the flag was raised in time for the Olympic opening day. Understandably, LGBTQ+ rights and Pride demonstrations are something we are one hundred percent behind. Moving forward, we are always looking for ways that we can better show our support for this cause. This year we are partnering with the Vancouver Pride Society working with them to raise funds and create engaging signage for their event. Also, we are a new print partner of Out on Screen who puts together Vancouver’s Queer Film Festival. 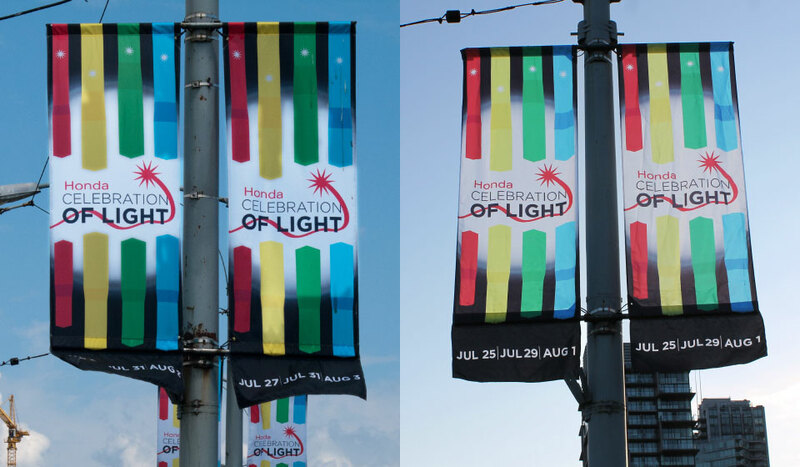 Look for the banners we made for them at the festival which starts August 13th! *In 1978, the year the rainbow flag was launched, one of The Flag Shop’s conscious designers attended the San Francisco Gay Freedom Day Parade with rainbow flags and decals for himself and his friends crafted out of our Vancouver location. If you’re particularly excited about the Pride Flag be sure to enter our #PrideFlag contest via Instagram & Twitter! Slate: How the Rainbow Became a Symbol of the GLBT Movement. 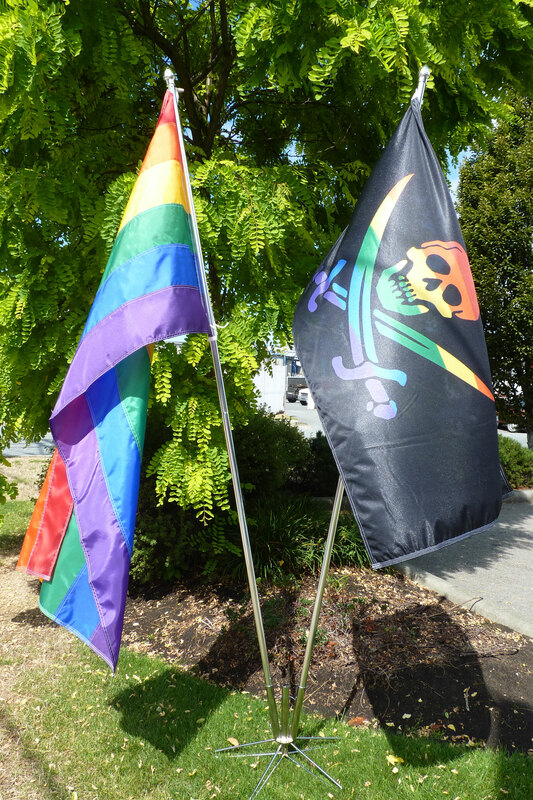 The Vancouver Pride Parade is fast approaching, and things are getting rather technicoloured here at The Flag Shop. We love the pride flag (a lot! ), and we want to see it out in the community. But we need your help! This is where we ask you, fellow flag enthusiasts, to snap a picture of pride flags out in the community, and share it with us on Twitter or Instagram! All you need to do is take a respectful photo of the rainbow pride flag somewhere in your community and then, using your preferred social channel, post the picture to either Twitter or Instagram tagging us here @TheFlagShop and using the hashtag #PrideFlag. You have from now until Sunday, August 2nd at midnight to enter via Twitter and Instagram. One entry per person or organization! If social media isn’t your thing, we have another way to enter. Stop by our Flag Shop booth at the Pride Festival on August 2, 2015, and you can enter to win by filling out a ballot. No purchase necessary. Two of the flag prizes available in our #PrideFlag Contest. Not pictured: The Canada Pride flag, as it is currently in production. The sewn nylon flags will be drawn for on August 4th at approximately 12:00 pm. Don’t have a flag? We will be handing out 1,000 paper pride flags to our social media followers at the Pride Festival in Vancouver’s West End on August 2nd. Be sure to come and get one for yourself! The Flag Shop is involved in Pride events all over Canada. 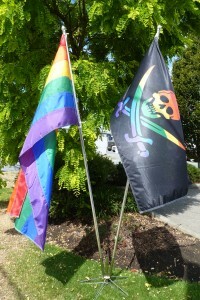 For a comprehensive look at The Flag Shop’s involvement, as well as to purchase Pride products online please visit: http://pride.flagshop.com/. You are currently browsing the The Flag Shop Blog blog archives for July, 2015.